There’s nothing like fresh potatoes from the garden. If you’ve never had your own home-growns you can’t imagine what you’re missing. There are so many ways to fix them, but one of our favorites is Oven Fried with Olive Oil, dried Thyme, and then Vinegar added after cooking. 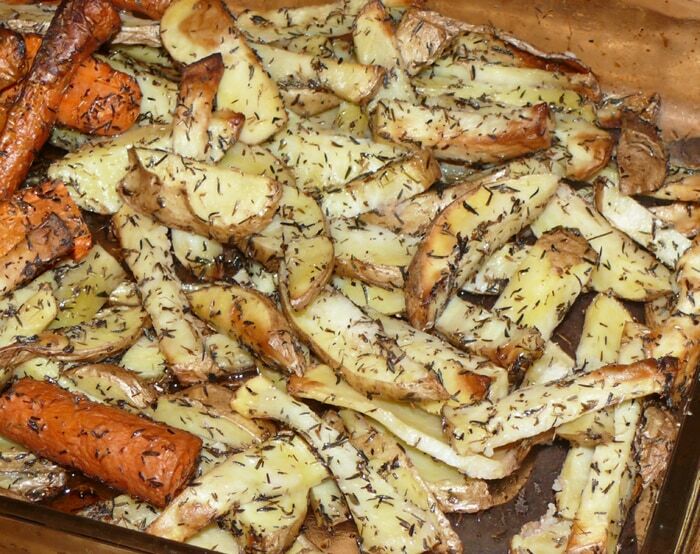 If you can’t use vinegar, but all means try just the Oven Fries tossed in the oil and thyme. (Or substitute fresh lemon juice?) The thyme with the olive oil does something magical to the taste! Be sure to buy organic potatoes if they are not your own, because you want to leave the skins on without fear of harmful chemicals. Splash with organic balsamic vinegar or organic apple cider vinegar or organic red wine vinegar. Keep tasting until you’ve got it just right. Fabulous with a good steak. Or cook with carrots like we did and make a meal of it. We also, enjoy oven roasted potatoes but I toss them with turmeric and oil. After spreading them on the pan, sprigs of rosemary are laid on top. When it comes out of the oven, I’ll strip the leaves off the rosemary, and sprinkle on the potatoes. The extra rosemary is hand-crushed and added to bread dough for a wonderful rosemary bread. Sounds like using turmeric as the spice on the potatoes would be very interesting. Wouldn’t you know my Rosemary plant is at the back of the property, but I think I’ll walk down in spite of the cold and get a few springs so I can try this recipe. Thanks for adding this. I’m sure many will enjoy the variety. Since you can’t use vinegar, I’m thinking you might use some of your fresh lemons from your little tree if you have any left. If you do, let me know how you like it. Sure sounds great. Sheri, you put a smile on my face. I’ll talk about potatoes probably before it’s time to plant. I use to grow them and will share the little I know via email to you. Stay tuned and thanks for commenting. I wish you would share with all of us what you know about growing carrots. I’m afraid that my experience with carrots is not the best. They’ve never been one of my favorite crops. At our first garden —with my improved clay soil — they just didn’t want to do what I wanted them to do — so I stopped growing them. For the last couple of years I’ve started growing them again. (I now have improved sandy soil — which they like a little better.) I planted carrots in May and they were not the most beautiful but tasted pretty good. I started more in mid June and those appear to be about the nicest I’ve had. Red Cored Chantenay was the variety. Then I planted Danvers Half Longs and thought they were going to do wonderfully as well — and then something ate them. Anyway — it’s fun to have a few, but they’re not one of my major crops. Hope this helps some. Good luck with yours next spring. Let me know how you do.